For his work in discovering the Mandelbox formula of 3-D fractals, the winner is Tom Lowe, better known on Fractalforums.com as Tglad. Now some might ask why Daniel White and the Mandelbulb Team weren’t this year’s Nobel recipients, but while the Mandelbulb discovery was truly the most exciting event in the fractal world this past year, and possibly the past two years, and has certainly received much more popular attention and interest, I felt the development of the Mandelbulb was an achievement of a more technical and scientific nature while the Mandelbox represents a development with a much greater impact and influence on fractals as an art form. Yes, the Mandelbulb really became quite “famous” back in November, but the recent variation of the Mandelbox has added a lot more to the visual aspects on the current trend in fractal imagery. There are so many good examples to choose from that it is difficult to fully represent what can be done with the new set of programs and algorithms available. There are so many examples because many others have noticed the potential of the Mandelbox formula and since these things have been so freely shared without restriction with other fractalists, the formula has been incorporated into a number of programs such as Krzysztof Marczak’s (Buddhi) Mandelbulber and Mandelbrot 3D by Jesse (I only know his screen name), both of which are freely available. Furthermore, thanks to the help of veteran Ultra Fractal programmer, Dave Makin (alias David Makin on FF) the Mandelbox formula is available for UF as well. In fact, I believe UF is what Tglad used for both his current and early renderings of the Mandelbox. The Mandelbox didn’t exist until February of 2010, which means at his point it’s only been around for about three and a half months! Like the the great Mandelbulb discovery, you can follow the development of the Mandelbox from it’s earliest form as an idea in Tglad’s head (inspired by a related group of 3D fractals) to it’s final incorporation in the three programs I just mentioned. It all happened on Fractalforums.com and one can at least speculate that without Fractalforums.com and Christian Kleinhuis’ (Trifox) sponsorship and management of that online fractal forum, such advances in fractals may not have occured or would have been greatly hindered. It’s also possible, I think, that the excitement and attention which the Mandelbulb event stirred up, also attracted and brought together the people who developed the Mandelbox. I’m still reading through the archives of all these threads over at Fractalforums.com (and trying to keep the screen names straight) so I’m not as up to speed on these events as others who’ve been following them for longer may be (i.e. I could be wrong…). Tglad has put together a small online gallery for the Mandelbox and it’s best for you to go there and read his explanations of the Mandelbox since the technical side of fractal art is not my forte. One thing I can mention however is that the Mandelbox exhibits something which is a rather uncommon sight in fractals and that is a great amount of non-self-similarity. 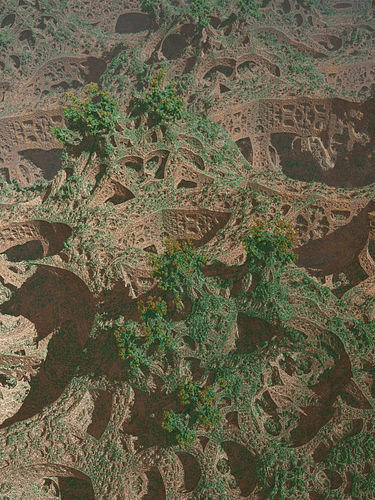 This, of course, is what makes the Mandelbox so much more interesting (from an artistic perspective) than the famous Mandelbulb. Tom has involved two features that I think I understand: Julia sets and Folding. What it comes down to is that you don’t see the same shapes, forms and patterns everywhere in the Mandelbox just as you don’t see the same shapes and forms in every Julia set of the Mandelbrot formula. Julia sets are one of the easiest ways to produce graphically appealing variations of the Mandelbrot set that’s part of the mix found in the Mandelbox. The folding feature Tom has introduced just adds to the creative powers of the Mandelbox while at the same time maintaining it’s strong design qualities through rigorous and careful combinations of patterns (folded over on each other and rendered together). How’s that for a non-technical description of the Mandelbox? One other thing: Like the Mandelbulb and probably all 3D fractals and other types of 3D graphics, the Mandelbox will make good use of all the processing and memory resources your computer has. If you’ve been waiting for a good reason to upgrade you computer, this could be it. But as you can see, even from these prototype images of the Mandelbox, the rich results make all the time and processing power worth it in the end. 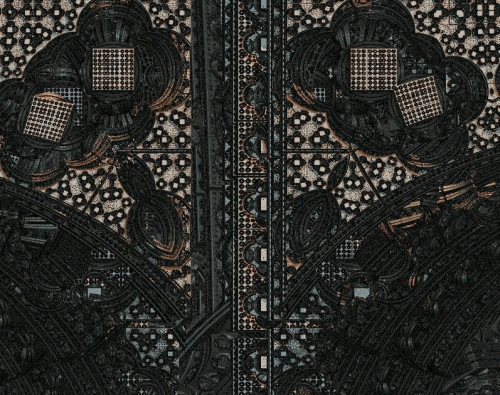 Take a look at this internal exploration of a Mandelbox done by bib (Jeremie Brunet) which was based on a series of images posted by Tglad to FF. I’m sure this took some time to make, but again, well worth the effort, I’d say. Since that day in early February, 2010 there has been a lot of rendering variations of Tglad’s original formula but Tglad’s own work still ranks among the best that I’ve seen. Although Fractalforums.com may not be, as Christian Kleinhuis (Trifox) himself stated in a comment here at Orbit Trap, a fractal art site but simply a fractal site with an associated image gallery, many of the images there have strong artistic qualities and fulfill the role of art as much as they do the role of illustrations embedded in their related discussion threads. Tglad’s posted work is one of the best examples. From his earliest examples of the Mandelbox formula to the one below, posted 2 months later, he’s demonstrated that in addition to his technical skills of a formula developer, he also possesses a real eye for art, particularly color and composition. In closing I’d like to say that I think the Mandelbox and the other 3D fractal types have ushered in a new era of fractal imagery. A lot of the older, 2D stuff looks pretty stale to me right now and I don’t think it’s a temporary feeling. 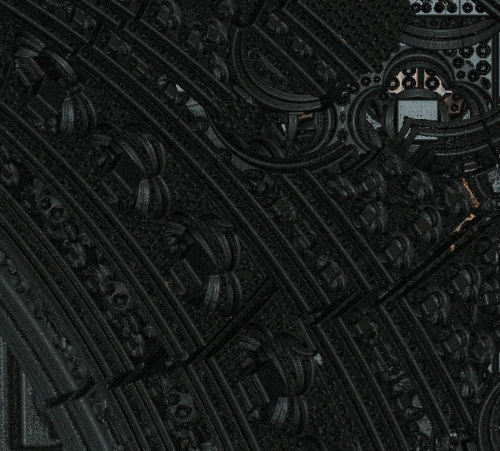 I noticed this particularly while browsing the Fractalforums.com gallery. The old stuff looks even older to me now. I’ll have to confess that over the last few years I’d become rather bored with fractal art in general. The only thing that really interested me was my own work and that of Samuel Monnier’s “Pattern Piling” technique. The Mandelbox and other 3D experiments on the Fractalforums.com site have changed all that for me. Fractal art is exciting again and it’s because of these new algorithms and formulas and the great imagery they produce. It’s more than just being “3D” instead of “2D”. It’s not like all of a sudden the images are exciting because they’ve been enhanced with some new feature or gimmick. What the 3D algorithms have added to fractal imagery is much more substantial than just another kind of enhancement. What’s new and different are these fresh new designs, forms and shapes that the 3D algorithms generate that the old 2D algorithms couldn’t make. Of course, ultimately, everything becomes a flat, 2D image on a computer screen (unless it’s a 3D stereo image set) and whether the depth and perspective in the image comes from a system based on 3D voxels or just 2D pixel rendering tricks (height-field; bump-map) it all has the same effect of giving fractal artists more tools for use in their creative pursuit of making fractal artwork. To the fractal scientists however and the formula developers, these differences in the underlying mechanics have more meaning and subsequently attract more of their attention (i.e. not everyone pursues fractals for the same purpose). It’s a fractal renaissance. And if I had to pin an award on just one of the many people who have played a role in bringing it about I’d choose Tom Lowe. Or rather, I’d start with Tom Lowe. I’ve got many more awards to give out, a Nobel prize is just the beginning. I’ve also got a: Knighthood; Oscar; Medal of Honor; Purple Heart; Court-Martial; ye olde forty minus one… There’s more. A lot more to come. An unusual thing about these Mandelbox pictures compared to most fractal art is that they aren’t generated or sculpted or composited together, and aren’t the result of tweaking many fractal parameters. Rather they are all shots from different locations of the scale 2 or scale -1.5 shape, just using different lighting, colours, focal settings etc. So the art is more like photography than painting or sculpting; finding good scenes rather than creating good scenes. Well, it looks like you guessed my next award. I suppose mentioning “knighthood” was a pretty good clue, though. Perhaps I’ll coin a new order of knighthood and create the Order of St. Sierpinski. 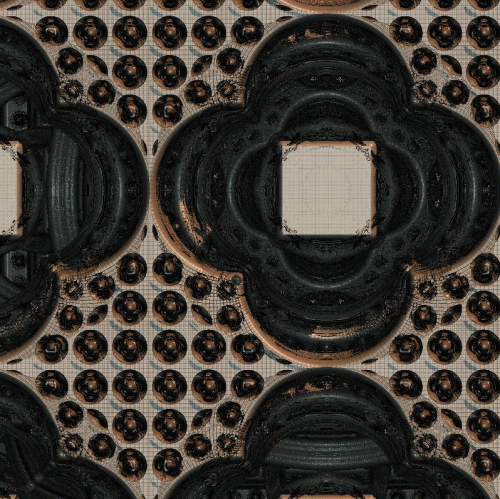 There’s just so much interesting stuff on display over at Fractalforums.com, it’s hard to know where to start.